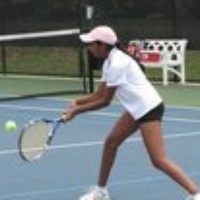 I teach beginner to intermediate tennis. You will learn proper grips, forehand, backhand, volleys, serves etc. I can get you playing tennis in 7 to 10 lessons. Raynee can recommend a location or come to any court inside the highlighted service area below. PGA Tour superstore, 2911 George Busbee Parkway, Kennesaw Georgia 30144. The cost of this courts is $20 and hour. With my membership. Student must pay court cost of $20. an hour for lesson.